An 8-foot-wide porch made of ironwood with a Zincalume metal roof provides shade in summer and keeps snowdrifts from doorways in winter. From the veranda of their cabin, all Patti and Neal Mitchell hear is the wind whistling through the pine trees c and, if they’re lucky, one of the turkey-size grouses that live in the area. “Sometimes we’ll also hear the screams of mountain lions or see the footprints of a bear we call Oscar,” Neal says. 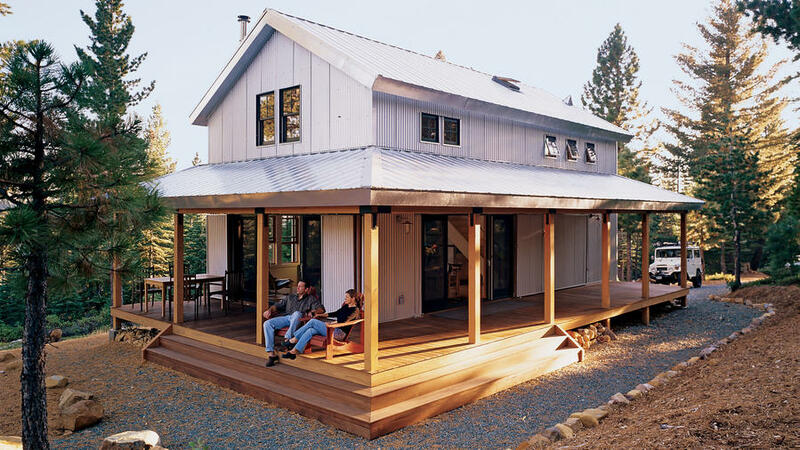 Their metal-clad cabin sits near Grouse Ridge in the Sierra Nevada, about 6,500 feet above sea level and about 30 miles from Nevada City, California. Its exterior design is simple and functional, since it must deal with heavy snow loads, provide fire resistance, and also be able to lock securely. Architect David Wright based its shape and metal surfaces on U.S. Forest Service maintenance buildings that dot the area. The 980-square-foot structure is “off the grid,” thanks to an array of photovoltaic panels that store the electricity in a series of heavy-duty batteries. A propane tank powers the stove, refrigerator, and a pump, while a woodstove heats the interior. The cabin is sturdy and exceptionally energy efficient, because it uses Structural Insulated Panels (SIPs) in the walls and roof. (The precut panels helped speed the construction of the cabin, which had a limited window of time in midsummer for the contractor to build it.) The SIPs make the house so well insulated that in five years, the Mitchells have used only 1½ cords of wood for heat. The precut panels for the walls and roof cost $24,875 from (30/477-8017). In winter months, the Mitchells use a refurbished 1955 Sno-Cat to haul them, their teenage son, their three black labs, and supplies. The family loves going to Grouse Ridge on midwinter nights during a full moon, since “it’s bright as day and you can see for miles,” Neal says. Neal telecommutes to his office in the Silicon Valley, thanks to a laptop and cell phone. He also enjoys a projection DVD player. “On nice summer nights, we set up a screen on our porch and show outdoor movies,” he says. That’s roughing it the modern way.